I am sick in my heart. Words are difficult. I have always felt a special warmth for Orlando and its people because of the time I spent there as a child. I saw Disney World get built, stood by my grandfather at the ribbon cutting, and years later, watched my own children fall in love with its special charms. I’ve also sat in shock and despair as Florida’s gun laws have descended into madness. Your pediatrician is legally barred from asking if you have a gun in your house as a matter of public health. It is illegal to punish a child for making a gun shape with his fingers, lest he get the impression that gun ownership is stigmatized? Glove compartments so often packing that Floridians have come to refer to that have come to be known as ‘gun compartments.’ How ironic. When my grandfather dedicated the park in 1971, the love for ‘traditional American values’ was the hallmark of conservatives, and that love bonded the Disney constituency with that of the NRA’s. The two were nearly one and the same. 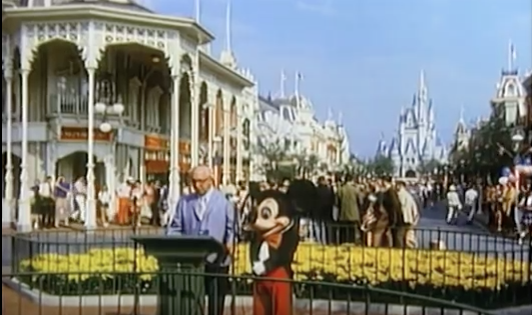 So how is it that in 2009, the two entities found themselves on the opposite sides of a courtroom, fighting over whether employees should be allowed to bring concealed weapons into the happiest place on Earth? The idea is absurd on its face. So when PBS approached us about creating a town hall on “Faith & Guns” with a panel of evangelical Christian leaders after The Armor of Light’s first broadcast, we immediately thought of Orlando as just the right place. It felt like a place where all the forces that have brought us to this regrettable impasse were aligned for maximum visibility. If there was going to be another tragedy like this, Orlando was a likely place for it to happen. There are plenty of gay bars in New York and LA after all, but you knew it was bound to be Orlando. It feels awful to have been right. So our shooter walked in with his thoroughly legal and thoroughly devastating AR-15 and took 50 lives (or more, depending on the status of a number of the injured). The fact that he was Muslim will mean that people will tell us that this is a simple and straightforward matter. We know what he wanted and why he did it. Then again, he hated gay people. Others will tell us that it is a simple and straightforward matter. We know what he wanted and why he did. Well, I do think it is more simple than we make it, but not in the ways those people are telling us. For one thing, nearly a billion Muslims are angry about all the same things as this shooter, but somehow they don’t go about assassinating a myriad of strangers. Even if he claimed a link to ISIS, in practical terms, he doesn’t seem psychologically any different to me than Dylan Roof. After all, even Muslims have psychology. Then again, Dylan Roof took a twisted ideology with roots in good things like patriotism and Christianity, and warped it into a reason to act out his darkest fantasies of heroism and masculinity. Roof also chose to brutalize not only his victims, but also at a place chosen for its symbolic value and in a manner calculated to instill terror in the hearts of a broader set of people for overtly political purposes. Sounds like a terrorist to me. How much energy are we going to waste in the next weeks and months shouting each other down about whether it was hate or terror when the two are obviously one and the same? They are both personal. They are both political. Of course, had either of these mass shooters not had such easy access to a deadly weapon of such tremendous and even unnecessary power, a lot of sons and daughters, brothers and sisters, mothers and fathers, and friends and lovers would be alive in the arms of their families today. Love and prayers are no longer enough. We can never entirely solve this problem; it is true. But we haven’t even tried to mitigate it. There is a veritable orchard of low-hanging fruit: Background checks, ammunition limits, and closing the gun show loophole for starters. As Dietrich Bonhoeffer told us “not to speak is to speak. Not to act is to act.” As Obama said today “not doing anything is a choice too.” The time to speak and act is now.